Whenever you want to make a slideshow for business or educational purposes or just for fun, make sure you are using a decent application. Icecream Slideshow Makeris a user friendly and versatile tool which offers a bunch of useful options for creating good looking slideshows. Besides, it isn’t too complicated even for novice users. 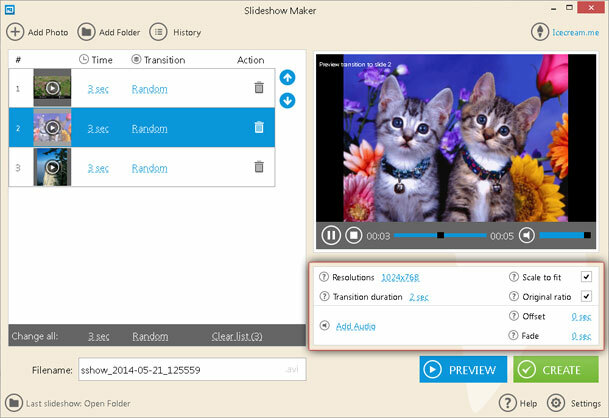 Check this tutorial to get a better idea of how to make a slideshow with Icecream Slideshow Maker. 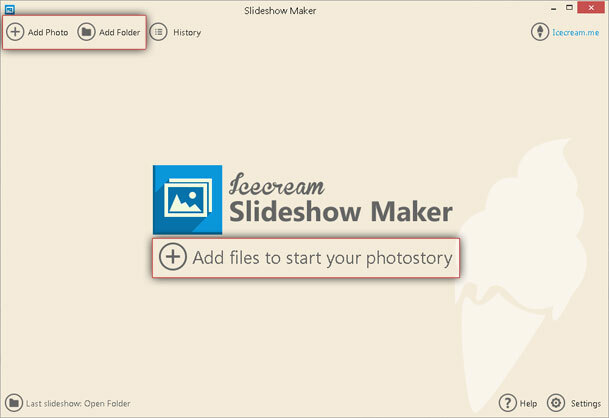 First thing you need to do is to download Icecream Slideshow Maker onto your computer by pressing the “Download” button on this page. You will be asked to save the installation file on your computer – do that and run it once it’s saved. After that, you can skip straight to the installation. Typically, it only takes about 30 seconds, and Installation Wizard makes the process way easier to complete. Finally, open the program and start creating a slideshow from scratch. Firstly, you should import a photo to work with. To do that, click on the “Add photo” or “Add files to start your photostory” buttons (upper left corner or center of the program respectively). You can pick a single file or press and hold the CTRL key to select several files. Alternatively, click on the “Add folder” button in the upper left to import a folder with a number of images. Note that the program imports all the files from a folder, including those saved in the subfolders. After clicking on one of these buttons, you will see Windows Explorer that allows you to import images from your computer. The program filters the files by format and you see only those that are supported by the application. Once your files are added, the main window gets split into two sections: queue on the left side and preview window and settings on the right side. In here, you can configure the settings for your slideshow. File queue is displayed at the left side of the window. If you want to move a file, click on it and use the arrows on the right to move it up or down. Feel free to use the recycle bin icon on the right of the file to delete it from the queue. You can configure time and transition characteristics for each file in the queue by clicking on a corresponding button. The “Time” parameter stands for the time of displaying the image. The “Transition” option allows you to choose an effect for transition from slide to slide (including no effect and random effect). You can see the effect in the built-in player at the right side – it will be previewed automatically. “Time” and “Transition” are the only configurations that you can set for each file individually. The rest of the settings will be applied for all files in the queue. In case you changed your mind and want to set the same configurations for all the files in the list, check the gray area under the queue – in here, you can change time and transition characteristics for all your files and also delete all the files from the queue at once by clicking on the “Clear list” button. There are some additional settings available under the preview window in the bottom right. Particularly, you can choose a desired resolution for your project (from 640x480 to 1600x1200) and specify transition duration for the effects that will be applied to all the files in the queue. Check the “Scale to fit” box if you want your file to fit the screen and “Original ratio” box to keep an original aspect ratio. If you have any questions about the settings, move the cursor over the question mark icon and read more about them. The “Add audio” button in the bottom left corner of the preview section of the program allows you to make a slideshow with audio - select an audio file from your computer and use it as a background sound for your slideshow. The “Offset” and “Fade” settings that are on the right side from the audio file will help you configure the track according to your preferences. Negative offset means that the audio will start playing immediately, shifted by a certain time, while positive offset stands for playing after a specified time. Once all the settings are configured, you can preview the slideshow on the right side of the window and start making a slideshow. Once all the configurations are set, click on the “Preview” button to make sure everything looks exactly like you want. Press the “Create” button in the bottom right to start making the slideshow. There are “Pause/Resume” and “Cancel” controls in the bottom right corner – they are available during the entire process of creating a project. A popup window will notify you of the completion and offer you to press the “Open folder” button and view the project in a containing folder.